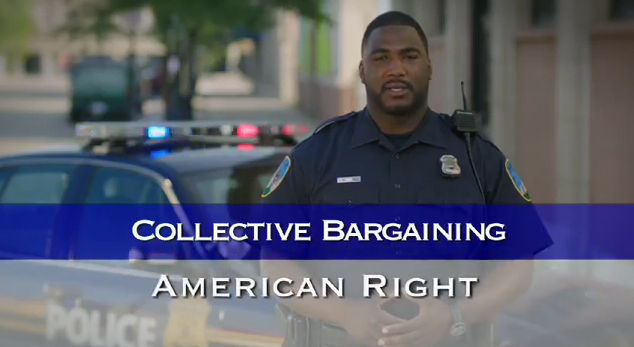 The “Protect” ad comes from Protect Our Jobs, a ballot committee with support from union interests and Democratic elected officials, among others that is pushing Proposal 2, a constitutional amendment on collective bargaining rights. As of a July campaign reporting statement, POJ had raised a little more than $8 million. Among the largest contributors were: the AFL-CIO ($1,250,000), the United Auto Workers ($1 million), the Michigan Education Association ($500,000), AFSCME ($500,000), Teamsters ($333,334) and Professional Staff Association of East Lansing ($300,000). The ballot language, however, says that if passed, the proposal would invalidate existing local laws that restrict “the ability to join unions and bargain collectively,” and “override state laws that regulate hours and conditions of employment to the extent that those laws conflict with collective bargaining agreements.” It does stipulate that state laws may be enacted to prohibit public employees from striking. A memo from the Michigan Education Association Legal Department, in fact, lists an array of measures that would be nullified if Proposal 2 passes, including prohibitions on allowing collective bargaining negotiations on such topics as teacher placement, teacher discipline policies and teacher evaluation systems. Robert McCormick, a professor at Michigan State University’s College of Law, said that private-sector workers already have the right to organize and bargain collectively under the federal National Labor Relations Act, and that Proposal 2 appears to be aimed at getting the same protection for public-sector workers, who have seen their agreements threatened in states such as Wisconsin in recent years. Michigan is generally more unionized in its work force than other states, though the rates have been dropping. Focusing on public-sector workers, unionization rates are down in Michigan, too, but are still higher than the national average. According to unionstats.com, 17.5 percent of Michigan workers were union members in 2011, though a large disparity exists between rates in the private sector (11.9 percent) and the public sector (52.0 percent). While it’s true that union membership is not compelled for workers in union shops (under the federal Taft-Hartley Act), non-members can be assessed fees by the appropriate union to cover the cost of collective bargaining; non-union members receive the same pay and benefits as their card-carrying co-workers. “The amount of dues collected from employees represented by unions is subject to federal and state laws and court rulings. “The NLRA allows employers and unions to enter into union-security agreements, which require all employees in a bargaining unit to become union members and begin paying union dues and fees within 30 days of being hired. Overall impression: A constitutional amendment that nullifies existing state and local laws on collective bargaining can hardly be deemed a measure that does not “add any rights that workers don’t already have.” Also, the “no dues” claim is a distortion, in light of the standard practice of having non-membership, but represented, workers pay fees for the costs of bargaining. Truth Squad call: Foul. The genesis of the Proposal 2 campaign came from efforts at the State Capitol, either successful or mulled, to restrict the parameters of collective bargaining for public sector workers. To present the solution as something that does not change worker rights from the status quo is a clear distortion. Thank you for your well-delivered and cogent argument, backed by facts and good documentation.